The Wheels on the Bus Go ‘round and ‘round! Did you find yourself singing a certain song in your head as you read the title? Because if you did- you were spot on! This last birthday party I had the privilege of doing brought one of the most classic childhood songs to life! In addition to the wheels on the bus, we chose to add in a mix of children’s favorite animals which gave us the perfect theme for a first birthday party. 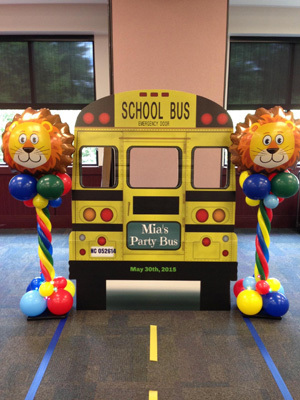 The bulk of this party’s theme was inspired by the animal bus image seen below. We decided to not only use the wheels on the bus throughout this event but also incorporate the classic animals on the bus as well. 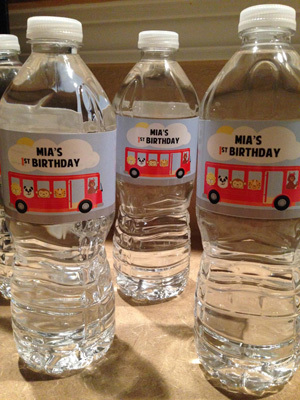 As you look at pictures of the entire event you’ll be able to pick out these exact animals and bus image on everything from these water bottles to the centerpieces to the birthday cake! So join us as I take you through a tour of Mia’s first birthday party! This bus stop greeted guests as they entered the party which took place at the Herb Young Community Center in Cary. The bus stop was made by family friends of my client but the cute monkey balloon is the masterpiece of Blooming Balloons! One of my favorite things about doing this party was the way we were able to incorporate balloons to fit the theme- and thanks to Blooming Balloons, it turned out incredible. Not only were they able to make a variety of the animals on the bus, but they were able to make stoplights, a bus backdrop, and more! When you first entered the room you were greeted by a “road” that led straight to a photo booth bus. How cute are the balloon pillars next to it? I have to add a zoomed in picture of the bus so you can appreciate how cute this turned out! The children loved going up behind the bus and sticking their head through the window for a picture. Additions like this are always fun because even though there is a photographer at the party, guests always enjoy having a reason to take their own pictures on their phone too. Balloon animals also greeted the guests upon their arrival as they were the centerpieces at each table. This worked out perfectly for a child’s birthday party because the children were able to take the animal centerpieces home with them at the end of the event. And what child doesn’t love a balloon animal? Guests were encouraged to leave a note on a paper cut out of an animal head and place it on this poster! Such a fun way to incorporate the theme into a sign in table. Appetizers were open as the guests arrived and of course they were chosen to go with the theme. Each appetizer item was chosen to match a phrase from the wheels on the bus song. For example “The wheels on the bus go ‘round and ‘round” went with the donuts on a stick. And “The wipers on the bus go swish swish swish” went with the pretzel sticks. Each item was a representation of the different verses throughout the wheels on the bus. About halfway through the party we had a storyteller come and sing classic children’s songs with the kids. Of course she started and ended by singing “The Wheels on the Bus” and in between she sang everything from Old Macdonald to the ABC’s. The kids LOVED her. They were dancing and singing along and having a great time! Having the storyteller there made for the perfect transition into cutting the birthday cake as Tricia (The Storyteller) led everyone in singing happy birthday to Mia. Mia’s cake was made by Party Delights and the cupcakes were made by the Cupcake Shoppe. While the cake was being cut, guests helped themselves to lunch provided by Nana’s Tacos. I loved the balloon stoplight and archway that framed the food! Also as you can see in the picture below there were balloon wheels and animal heads hanging from the ceiling. It’s the little details like this that really give the “wow” factor when you first walk into a party. Every kid LOVES goodie bags. And the ones at this party definitely lived up to their expectation. On their way out, guests passed a sign that read: “Thank you for wheeling over to Mia’s first birthday party! Please take a cookie.” There were cookies provided for every guest and then a goodie bag and animal cup for each child to take! We had a blast working on this party, but just like every bus ride… eventually this party had to come to an end too. We hated to see it go but we were so happy to be there along for the ride because it was a fun one! We absolutely loved being able to play a party in this first birthday celebration and we hope that Mia and her family enjoyed it just as much as we did! 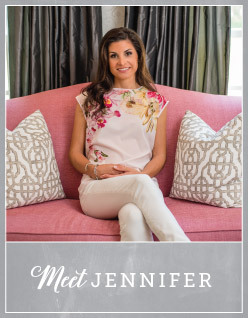 Wishing Mia a happy first birthday from Jennifer V. Events!